Washington, D.C. Area TESOL (WATESOL) - Color it Out! Fall Conference 2019: Save the Date! Color Vowel Chart - Color It Out! 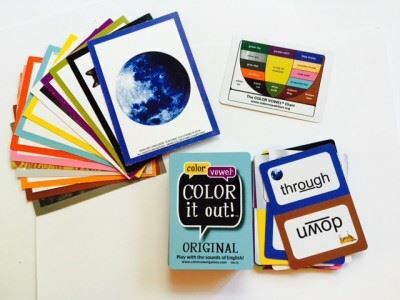 Color Vowel Chart co-creator Karen Taylor will lead a WATESOL professional development session with Color it Out!, an innovative spoken game with the Color Vowel Chart. Karen Taylor de Caballero is an educational consultant with over 20 years of teaching experience. She specializes in ESL curriculum design and teaching methodology with particular expertise in literacy and pronunciation. Based in Maryland, Karen is director of English Language Training Solutions and is co-author of The Color Vowel Chart. Come learn how this powerful, engaging game builds speaking and reading confidence while bringing together learners of all ages, levels, and language backgrounds. - Experience the game for yourself! - View video footage of learners playing the game. - Learn how schools across the country are using Color it Out! to build community. language, Q&As, and a raffle featuring Color Vowel products. No prior knowledge of the Color Vowel Chart is needed. Participants who already use Color it Out! in their classrooms are encouraged to attend and share stories! Learn more about Color it Out! here. Light breakfast will be served. & Parking Metro accessible - Columbia Heights Metro (Yellow/Green lines). Buses H2, H3, H4, H8, 52, 53, 53. Street parking available. Paid parking at DCUSA, located just a few blocks away.